VW, the world’s second largest automaker may not have tasted massive success in India in terms of sales volumes but they have carved out a unique strong brand perception for themselves. Also when it comes to one make championship racing, VW is the only manufacturer in India to have given us some very potent cars that can go close to international standards through their arm VW Motorsport India (VWMI)in the form of Polo Cup and Vento Cup cars since 2010. This move has not only been an opportunity for racing enthusiasts in the country to have professional racing support but also a great opportunity for the company to put their expertise to the test. VW has used the learning from VWMI to make their cars better, both on road and on track. In the meanwhile, VW launched their first subcompact sedan, Ameo, last year. And thus, VWMI got to do their magic on it and the Ameo Cup race car that has debuted in the 2017 season for VW’s one-make championship, and the Ameo Cup was born. 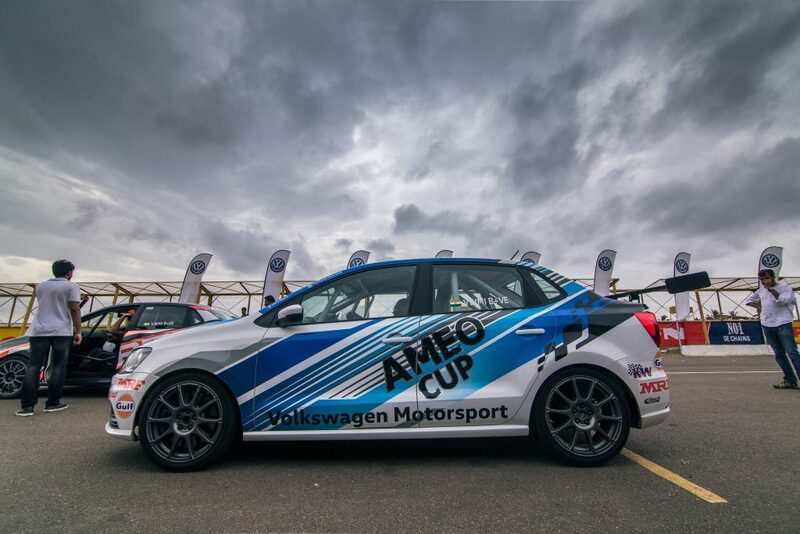 And guess what?VW claims that the Ameo Cup race car is the most powerful race car from the automaker’s stable and that too developed completely in house by their Indian arm. 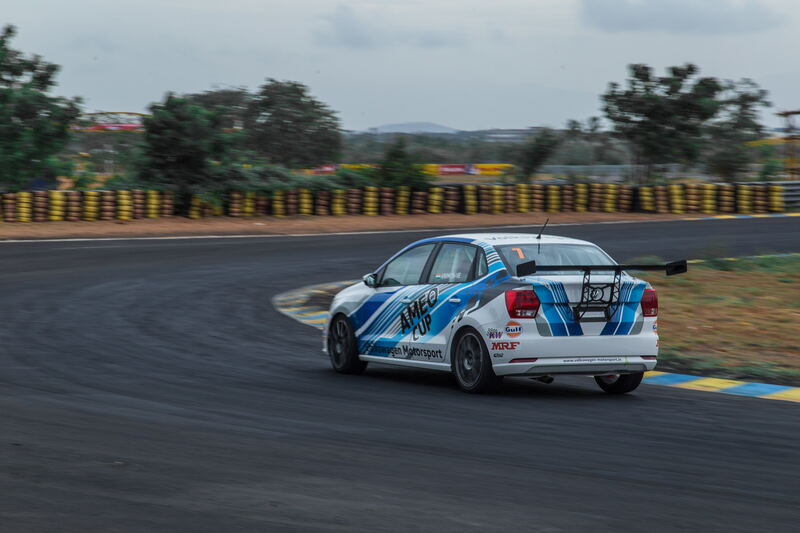 We set out to test it at the Kari Motor Speedway in our own city, Coimbatore! We will all agree to the fact that the Ameo is definitely not the best looking compact sedan in India. But one look at the Ameo Cup car in flesh, and our perception changes completely. We were floored! Personally, I liked the Ameo Cup car over even the Vento Cup car. In terms of dimensions, the Ameo Cup car is essentially the VW Ameo with some marginal difference. There are some elements that strike our eyes at the first look. The profile for example, the car is lowered and now runs on 17 inch wheels shod with MRF race slicks that fill the wheel arches so well that you could barely spot the shocks. Next the giant spoiler made of carbon fibre that is mounted at the back of the boot near the number plate holder. The spoiler truly adds character to the car and makes it look aggressive. The spoiler also improves the down force rated at about 50kgs at 120 kmph. Next is of course the sports livery that is similar to what we have seen already on the Vento Cup and Polo Cup cars. The racing seats with a red harness and roll cage are also visible from the outside. There are also some visible changes like a grill occupying the position of the fog lamps that diverts air to the front disc brakes, the hood-pins to lock the bonnet, sticker marking the position of the rear tow hook, etc,. Open the door and we are greeted by the sporty interiors. By sporty, we don’t mean all black interior trim, double stitch seat fabric, flat bottom steering wheel, aluminium finish, etc,. The Ameo Cup car is different kind of sporty–’the naked kind’.The interiors are completely stripped except the top half part of the dashboard and the front door pads. We squeeze into the roll cage to access the OMP racing seats with a 6 point harness that is set upright. 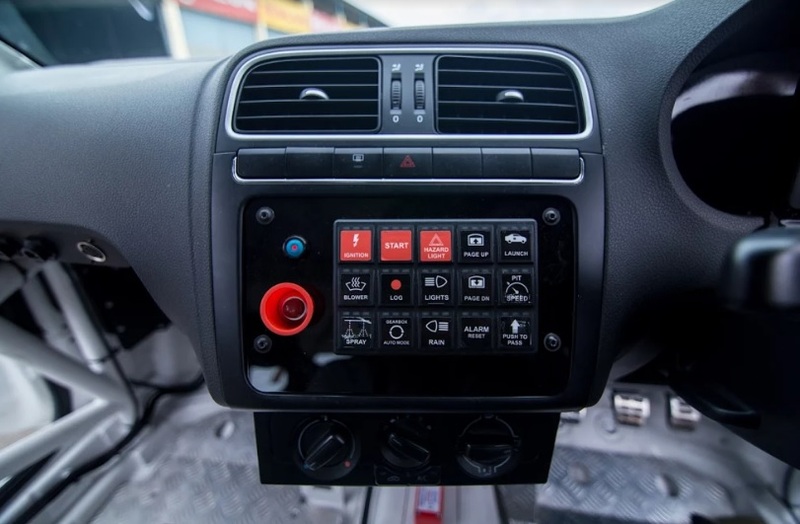 There is a key pad in the centre console with a host of functions like the mains, ignition, starter, pit lane limiter, fire extinguisher controls, launch control, windscreen washer, light controls and controls for digital dash. 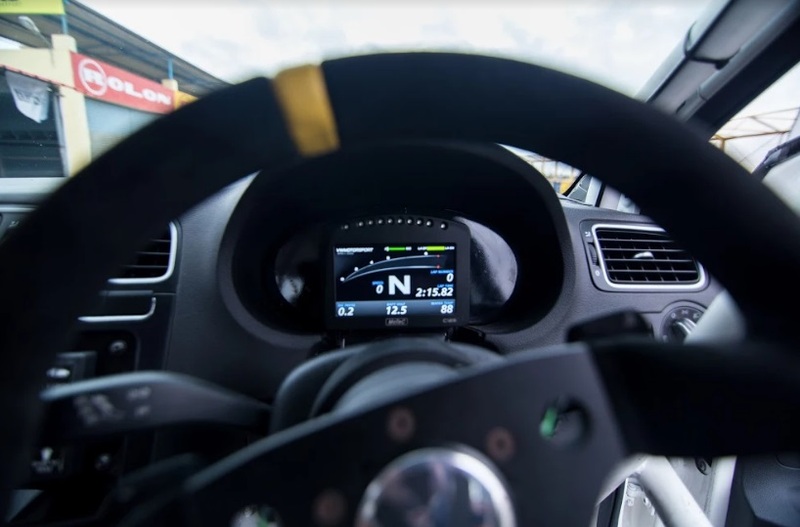 There is a digital screen behind the alcantara-wrapped racing steering wheel that displays all vital information for lap like lap timer, tachometer, gear position indicator, shift lights, etc,. There are AC ducts that blow air to the windshield only for defogging. And everywhere else we could only see steel bars running the length, breadth, and height of the vehicle. Getting a right seating position is fairly easy as there is no choice offered except for the rack of the steering wheel (Seating position will be adjusted for the racers though!). There is also an aluminium floor pan to provide the required grip. Seated and all buckled up, the feeling is definitely special, very special! The new Volkswagen Ameo Cup car is powered by the same 1.8-litre TSI motor that does duty on the company’s hot hatch Polo GTI making 192Ps and 250Nm which is a tight fit into the engine bay of the Ameo owing to its marginally smaller dimensions. This engine is already apower horse and the addition of a race exhaust, race tuned turbo and Motec electronics has made this engine a firecracker producing 203 bhp and 320 Nm of torque.The car is completely developed in VW’s Chakan factory by the VWMI’s team. Not just with the engine tune, VW wanted to make it a little more closer to international racing cars and so they ditched the DSG twin-clutch gearbox for a new 6 speed sequential race gear box from 3MO. The new gear box shifts quicker than the DSG and there is no sequential shift lever but paddle shifters. This is a unique combination that provides a true race car feel and at the same time, is easier to operate. This opens up a lot of possibilities for VWMI as they will be able to train novice drivers. “The car is unlike anything Indian motorsport has seen from the Volkswagen’s stable. It has more power and amazing handling, yet it is simple enough for budding racers to learn on. The race machine is on par with international standards and the new elements in the car make it possible to take our one-make series to a new high.” Said SirishVissa, Head, Volkswagen Motorsport India (VWMI). 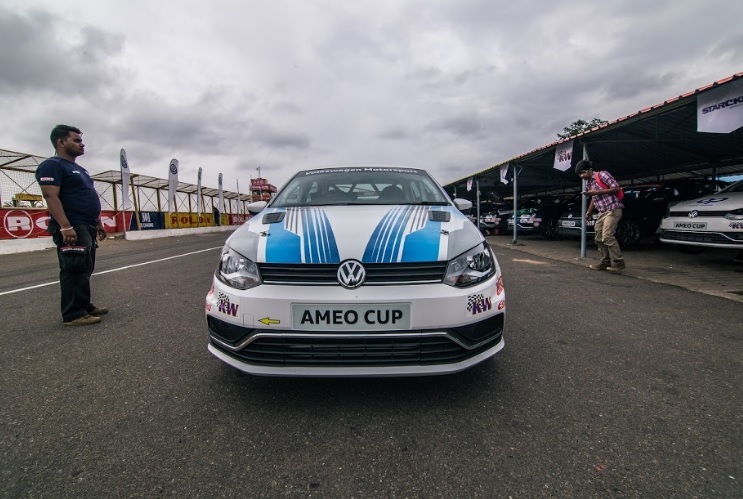 With a ton of upgrades, the Volkswagen Ameo Cup car is more powerful than the Polo and Vento Cup cars and is claimed to be 4.6 seconds quicker than the 2016 Vento Cup car around the MMRT. VWMI has put in a lot of effort in the weight distribution and handling department. The Ameo Cup car weighs about 1,150 kg. The stock weighs in the 1,044 – 1,184 kg range depending on variant and trim level. Stripping out a lot of trim and non-essential stuff has reduced weight. The position of the engine and the gearbox has been altered a bit to attain lower centre of gravity. Some of the other components have been repositioned, like for example, the windshield washer reservoir, battery, fire extinguisher tank are moved to the rear, and the gear actuator is positioned in the left foot well; this ensures an equal weight distribution. The spring ratings have also been tweaked to match the shorter wheelbase of the Ameo. Coupled with this, the 17 inch wheels are shod with special multi compound tyres developed specifically for this car by MRF chosen from over 40 combinations. Switch on the mains and the ignition. Then engage the clutch to press and hold the start button that fires up the engine, and it starts with a deep, raw racing growl. Being a person used to driving manuals on a regular basis, I found it difficult to move the vehicle without stalling it for the first time. With a pat on the throttle before slowly releasing the clutch, I was able to crack it in the second attempt; the car started moving with a loud exhaust note. This takes some time to get accustomed to, but the good thing is that the clutch is used to move the vehicle only from standstill and from there on the actuator takes hold the job. The car gains speed and we use the paddles to shift to the next gear. The gears shift with a nice ‘clunk’ from the sequential gearbox. The digital display adds to the drama by displaying the gear position in a big bold font, the tachometer above it and the shift lights on top of the display. Floor the throttle and the car roars past 5500rpm like a jet, pull the ‘+’ on the paddle and there is another ‘clunk’ and the engine throws linear power out to the wheels. Find a corner and slow down by braking first and then downshifting. One wrong move by downshifting before it is appropriate; the intelligent computer gets into damage control mode and doesn’t allow you to downshift saving the gearbox of any wear and tear. 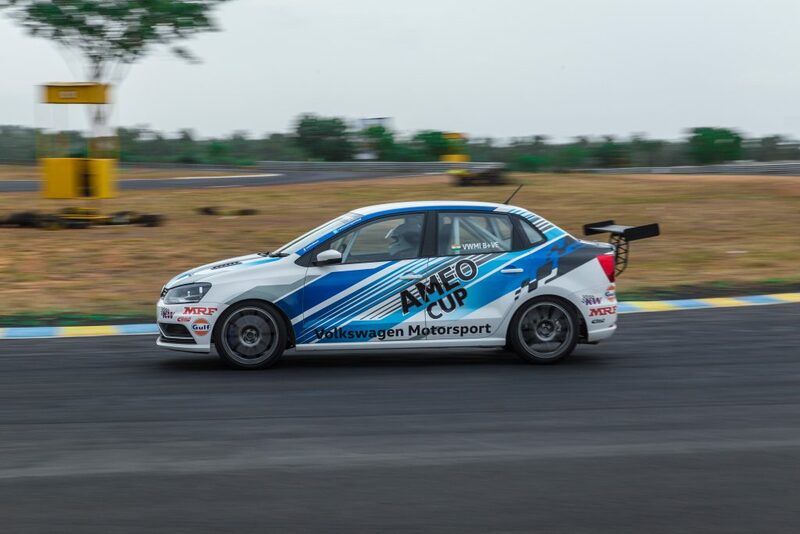 So, brake-downshift-accelerate to attack a corner and the Ameo cup car takes on the curve graciously. It takes a couple of laps to get used to the car and then, we never felt that we are in a FWD car. The steering is very precise and combined with the tyres, it sends a lot of feedback to the driver. The Ameo Cup comes equipped with a Sachs racing clutch while the front suspension comes with McPherson Struts with 2-way adjustable KW dampers. The rear uses a torsional beam axle.The suspension set-up is comparatively softer (in racing car standards) but it never took away the fun or composure of the car! Better brakes not only provide good control but also enable us to utilize the full potential of the car. The braking duties are handled by the 334 mm ventilated discs up front, 232mm discs at the rear and the package is completed by race ABS. 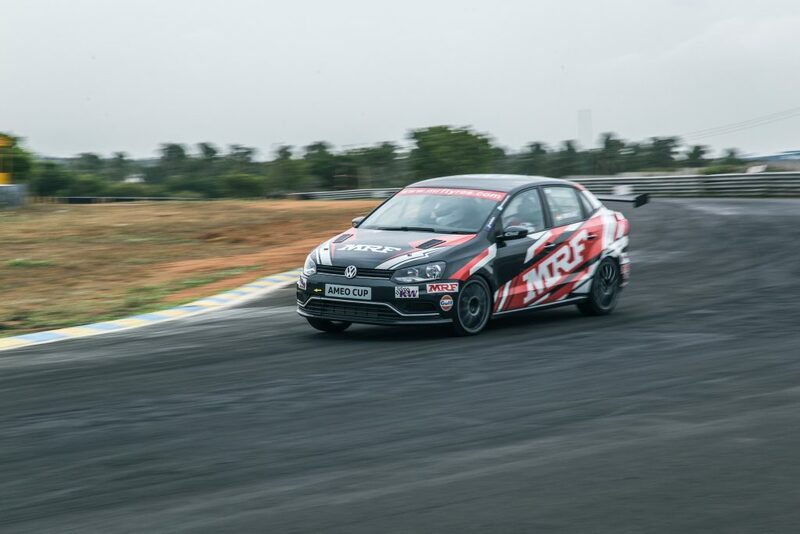 I can’t stop talking about the specially developed MRF rubber which is sticky and provides the right amount of grip in all conditions.The combination is terrific for this car and the braking is very powerful and progressive, allowing us to brake late in all corners. The Ameo Cup also comes equipped with a limited slip differential. On the safety front, the car comes with an 8-point roll cage and 6-point racing seatbelts, as per the guidelines of the FMSCI. We were told that the same car is available in a 266bhp tune too which needs 97 Octane fuel. But the inconsistent fuel quality in the country has made the automaker to hold back from using the same. By the way, 203bhp is good enough for novice drivers! There are two questions that we Indians don’t miss asking about any car: Fuel Economy and price. Well it is a crime to ask the fuel economy of a race car, the cost to build an Ameo cup car takes about 40 lakhs and with the expertise of VWMI, a car easily lasts for about 5 seasons of hard thrashing. All they do is change the oils and filters for every season! That is incredible engineering which can only come from the Germans! By and large, the Ameo Cup left us mightily impressed.